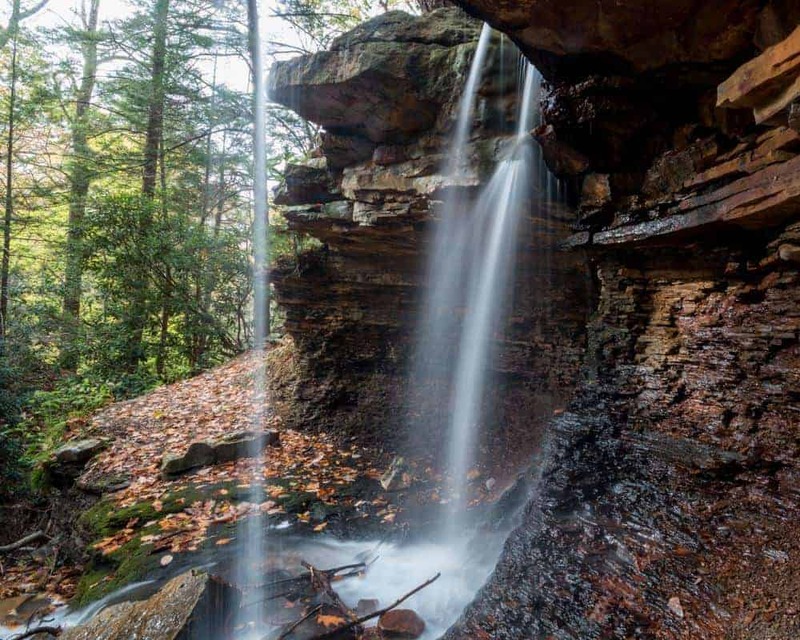 There are many awesome waterfalls in the Laurel Highlands: Cucumber Falls, Jonathan Run Falls, and Cole Run Falls just to name a few. However, there are some that get overshadowed by these frequently visited falls. Adams Falls is one of these. 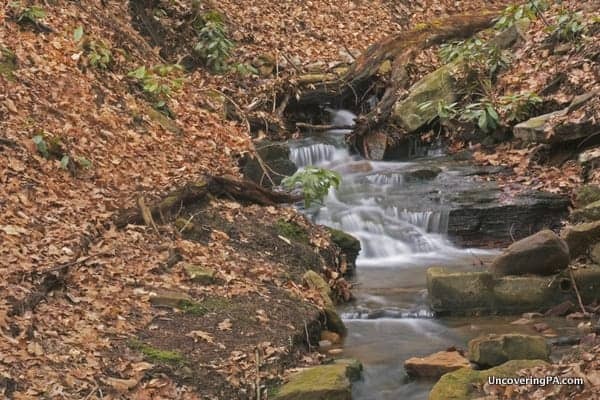 I was able to find very little information on Adams Falls when I was researching waterfalls in the Laurel Highlands. 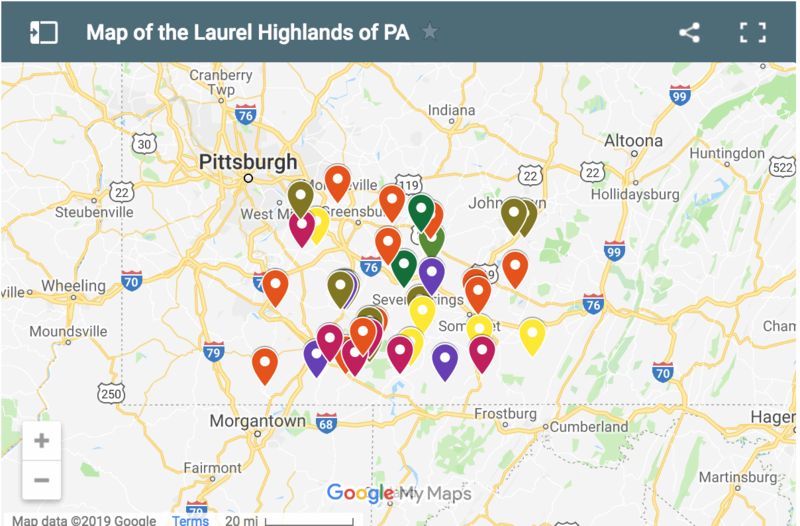 However, given that it’s located only 15 minutes outside of the town of Ligonier, I figured I’d take a chance and check it out. Truthfully, I had basically no idea what to expect going in. I didn’t even know what trail to take or where in Linn Run State Park to find the trailhead. That’s not usually a recipe for a successful hike, but Adams Falls is so easily accessible that I had no trouble finding it. 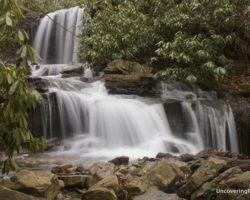 In fact, if you are coming from Ligonier, the Adams Falls trailhead is at the first parking lot you’ll come to in the park. 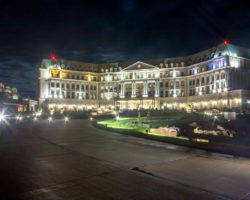 It is located at approximately the following GPS coordinates: 40.168976, -79.233788. Looking out from behind Adams Falls. After hiking along the one mile long Adams Falls Trail for about three minutes, I came to the top of the falls. Adams Falls offers a single plunge of about 15 feet down to a shallow, rocky area below. Viewing is from the top of the falls and many signs warn you not to venture to the bottom of the falls. However, if you must, cross over the bridge and take the relatively easy looking “trail” down the hill to your far right. 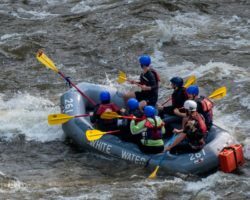 A series of scenic rapids just above Adams Falls in Linn Run State Park. Looking at the falls, it wasn’t hard to see why Adams Falls gets overlooked. While many other waterfalls in the region offer great vantage points and good water flow, Adams Falls doesn’t flow well even after the heavy rains have overfilled many of the other area waterfalls. 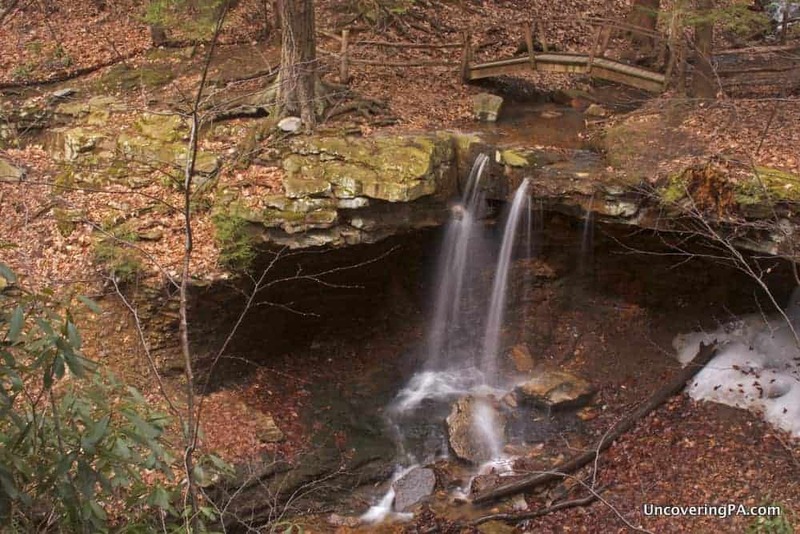 However, like I said above Adams Falls in Linn Run State Park has one big thing going for it: accessibility. You could conceivably make it to the top of the falls from downtown Ligonier in 20 minutes. Not too bad for a remote waterfall in a state park. A closer look at Adams Falls. Overall, Adams Falls is a nice little waterfall for anyone looking for something short and accessible. 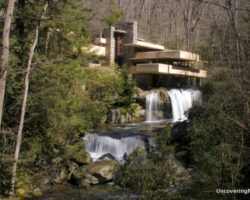 It’s certainly not the most amazing waterfall in Pennsylvania, but it’s definitely worth visiting for anyone who loves the beauty of falling water. 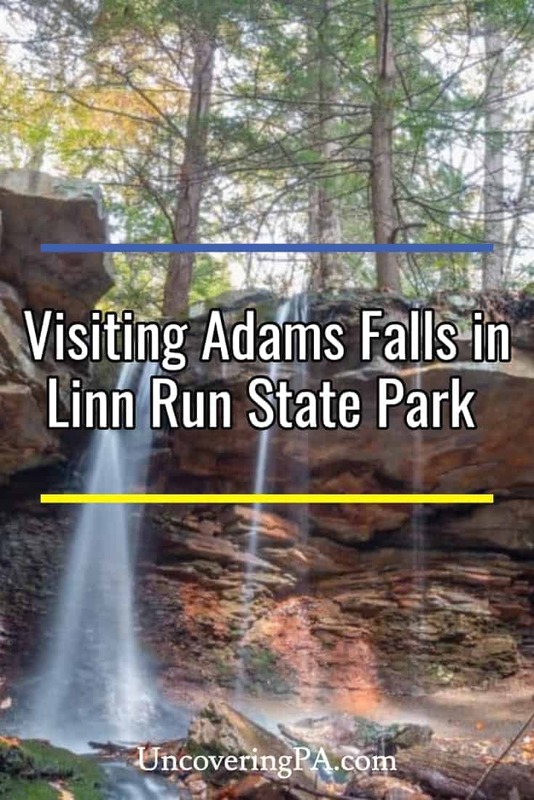 Once you’re done checking out Adams Falls, head over to the trailhead for the Flat Rock Trail, which is another great trail in Linn Run State Park. 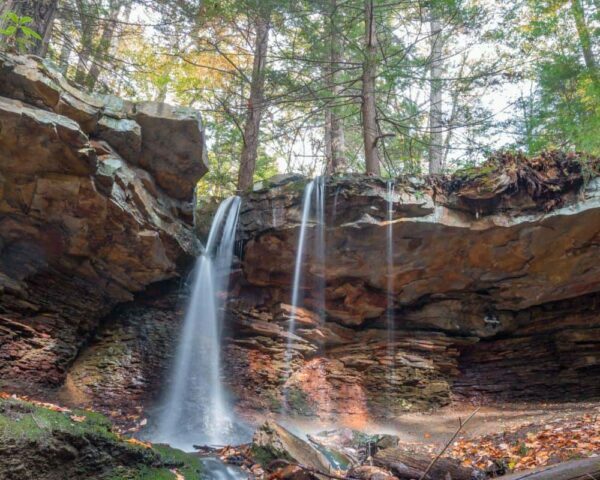 Note: Click the link if you are looking for information about how to get to Adams Falls in Ricketts Glen State Park. Thanks for this post. We visited Linn Run to see these falls yesterday and your info was very helpful. The only thing I would add is to say the trail starts from the upper Adams Falls parking lot. The first one has a playground on the right and a different part of the trail on the left. It’s a great trail, goes past an old abandoned building and ends at big rocks in the run. The upper parking lot goes over a bridge and has a big picnic gazebo. My kids loved being able to get right up to the falls, this isn’t something we’ve been able to do with any other falls we’ve visited yet. (Kids are young, don’t want to take any paths that are too tricky, but my husband and I were able to navigate them down this going nice and slow.) Thanks again! Kelly, I’m glad you enjoyed your trip to the falls and that my site was helpful. 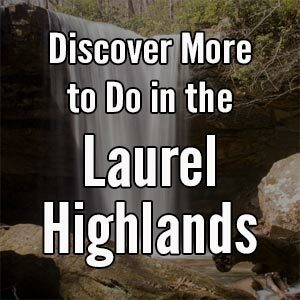 Love the site, will be going to look for this one the next time my g/f & I are in Ohiopyle!!! 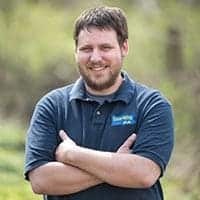 I have a ton of waterfalls you can add to your collection, we ought to hook up sometime! GPS Cords for parking areas would be a big help in getting directions, like the ones you gave me for Swatara! Thanks for the suggestion, Kevin. I usually have directions to the parking areas, but I’ll think about going back and adding actually coordinates where I can. Interesting, James. Just based on the similarity of the photos I’d say there’s a good chance that we were there at almost the same time.